I'm just putting things together and drawing conclusions like the rest of you guys. 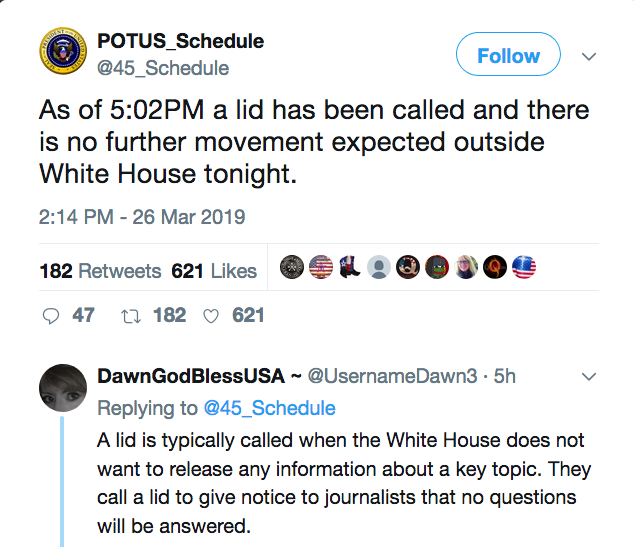 The Whitehouse lockdown is screaming at me. I'm probably wrong, but it's saying to me the "night of the long knives" for justice is underway. We won't know that until the Whitehouse says something. What higher-ups did to Rahm Emanuel/Chicago Police, is what Chicago Mayors/Police have been doing for well-connected people in the city for decades. That's why they recognized in less than an hour what happened to get Smollett off the hook. Smollett is very well connected. I am hoping he got off the hook here because federal charges are about to be brought. His attorney Mark Geragos has represented Clinton's brother & is/was representing Clare Bronfman. He is Avenatti's partner in crime and Avenatti has his own connections. While in college and later in law school, Michael worked at a political opposition research and media firm run by Rahm Emanuel (who later became White House Chief of Staff and is presently the Mayor of Chicago). During his time there, Michael worked on over 150 campaigns in 42 states, including multiple gubernatorial and congressional campaigns (i.e. Joe Biden’s U.S. Senate Campaign). At a court hearing on Thursday, Feb. 28, it was revealed that Teny Geragos was added to NXIVM founder Keith Raniere‘s legal team. The court was then made aware that Teny is the daughter of Mark Geragos, who represents co-defendant Clare Bronfman. The father and daughter work for two separate law firms. Hats off to him. ...Hope he's not in danger now. Color me skeptical, but given Emanuel's history and connections I wouldn't be surprised if he's only being so vocal about the Smollet case now because somehow he's linked to this mess. We may find out eventually. I don't think the Smollet debacle is over. I have a feeling that you are right about he Smollet thing not being over, and I have to say that it is a very bad feeling. I want badly to be wrong, but my gut tells me that the Smollet thing is Act 2 of a three act play that is setting up a huge blow, though fake (think FF), to the Right in this country. I had a prediction written out, but I'm going to withhold for right now and meditate on it and quitely pray over it for a bit. Sometimes it's better to pray for your enemies than to wish they get what is comming to them. I need to take the high road on this one, and do what is right in the eyes of God. Maybe under threat of federal prosecution, Smollett would perform like the African brothers and flip on someone higher up... like Kamala ‘Heels Up’ Harris.